Thank you to Skechers for sending these darling shoes for us to share and coordinate with outfits. As always all thoughts and opinions are 100% my own. 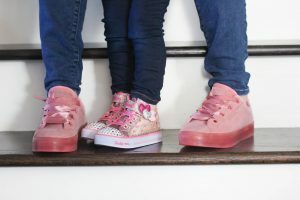 Izzy and I have been loving twinning together… since she was very tiny I would buy us matching headbands, then outfits and now I’ll even coordinate our shoes. 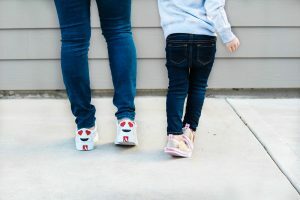 Because it is February and Valentine’s Day is tomorrow I wanted to share some adorable mommy and me looks for you and your tiny valentine or in my case, my galentine. 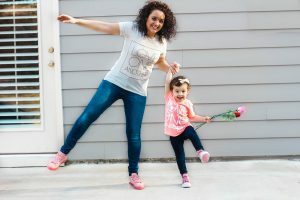 The thing I like about these looks is they aren’t matchy matchy and I hope they inspire you to find similar fashions to “twin” with your kiddos too! 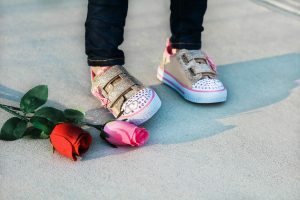 Boy mamas, there are some things in here for you too! I’m so happy to have this sweet ball of energy in my life. There are times I want to pull out my hair out… #momlife but all the snuggles, kisses and when you say I love you makes it all worth it! You are smart, determined, loving, stubborn, kind, creative and captivating. Happy Valentine’s to my Galentine for life! Twinning with my littles is my favorite! Love the shoes, you two look so cute! you guys are THE cutest!!! love those heart-eyes shoes!!! These are too cute! I’m loving your pink suede sneaks! Awe thank you! The brands with the tops are gender neutral & the pink t Izzy has comes in another color ☺️?? You guys are SO adorable. 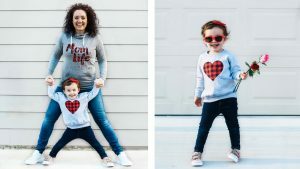 I want to become a twinning mom! Lol. I’m all for it. Love the coordination! Her shoes are adorable! !